Are you on Facebook? Let's connect! I announce each new Farmgirl Fare and In My Kitchen Garden post on the Farmgirl Fare Facebook page, often with a chatty intro, so following along via Facebook is an easy way to keep up with what's happening here on the blog. I also share timely links to seasonal recipes and gardening posts from the archives that I think you might find interesting and helpful. It's been fun to hear from so many of you over on Facebook, and I really appreciate your spreading the word about Farmgirl Fare and In My Kitchen Garden (the offshoot blog where I sporadically write about my organic heirloom garden and greenhouse). Thanks to all the current Facebook fans and welcome to the new ones! 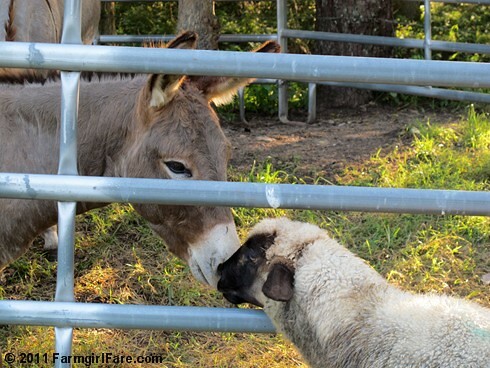 © FarmgirlFare.com, where Donkeyland has been so overrun with starving, treat-crazed sheep that the donkeys have to be fed in the safety of a impenetrable fortress (aka a temporary corral). Thank goodness the sheep are also friendly. Love the interspecies affection. Thanks for sharing. I have a facebook account but rarely even look at it. I'm already a FB fan. And I'm right there wih Elizabeth - are you in the new house yet? Monday Dose of Cute: Wake Up!